"If, like me, you miss the airy orchestral jazz of Gil Evans, this CD is proof that dreams do come true. … this is exciting, rich-textured music from a major new voice." "This recording is one of the most promising big band debuts in a long time … Somebody should send this orchestra out on the road." "She displays an impressive range, in the construction of pieces where the architecture owes more to the philosophy and aesthetics of the builders of finely chiseled cathedrals, than to today’s concrete frenzy. There is here, obviously at work, a strength and a conviction which knows the price of liberty, and the necessity, for this liberty, to be anchored to a form, at once open and safely marked out, to avoid getting lost. In such a sumptuous case (a velvet hand in an iron glove), the soloists give the best of themselves, and, perhaps, even more (Margitza, Ries, Monder, Hagans, Werner and, mostly, Perry)." "Maria Schneider has surfaced with perhaps the most stimulating big band quest in recent memory. 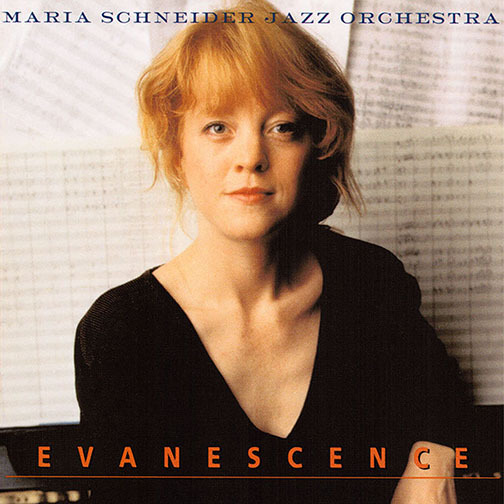 Evanescence – named for her association with mentor/teacher Gil Evans – documents Schneider’s masterful light and shade nuances of big band composing and arranging. … Evanescence surpasses mere intellect as she unveils a sense of drama and agility to an otherwise lumbering genre." "She does very well indeed on her debut, Evanescence. With soloists such as trumpeter Tim Hagans, tenor saxist Rick Margitza and pianist Kenny Werner, plus finely crafted arrangements touched by Gil Evans and George Russell, she is already a force." "Listen to the way the rhythm section is allowed to breathe, kick up its heels, and take the music to a new level on “Green Piece." "And some say jazz is dying! Each month brings its surprises: here is somebody almost unknown, Maria Schneider, composer and arranger, former assistant of Gil Evans, who, quite simply, signs one of the most exciting large band albums of this time. . … Maria Schneider builds her own universe, the one of a colorist with a large palette aware, between freedom and exactness, of the exact frontier to reach efficiency." "In an age when many jazz artists seem content to recreate the past, it’s comforting to know that some musicians are still looking for new sounds. Composer Maria Schneider’s new album Evanscence on the Enja label is a case in point. Using a big band made up of young, top flight players, Schneider paints musical pictures, mainly in subtle colors. … Maria Schneider has learned will from Gil Evans how to create moods and how to craft arrangements that support soloists. [Evanescence] bursts with splendor in the nine original compositions which make up Evanescence, perhaps the most accomplished of all large orchestra records made since the famous The Individualism of Gil Evans (1963, Verve). Maria Schneider goes back to the orchestral style of writing prior to the “electric” trend of the seventies, with much more creativity." "… Forty-eight years later, big bands are the dinosaurs of the music business – unwieldy, expensive and, some think, headed inexorably for extinction. But try telling that to the 17 musicians, who gather every Monday night at Visiones, a Greenwich Village nightclub, to play the music of Maria Schneider, a slight, strawberry-blond woman who, at the age of 33, is regarded by a rapidly growing number of insiders as one of the most promising young jazz composers in the world." Digitally recorded September 1992 and mixed by Paul Wickliffe at Skyline Studios, NYC. Cover photo by Jimmy Katz.